Schedule Update: PBOT's Central City in Motion Plan goes to City Council on Thursday, November 15 at 2:00 p.m.
(Nov. 8, 2018) Between now and 2035, our Central City – already the densest concentration of people and jobs in Oregon – will continue to grow. The Central City, which stretches from the West Hills to SE 12th Avenue and from the Lloyd and Pearl districts to Powell Boulevard and South Waterfront, will add an additional 38,000 new households (a roughly 160 percent increase) and about 51,000 new jobs (a roughly 40 percent increase). The catch? 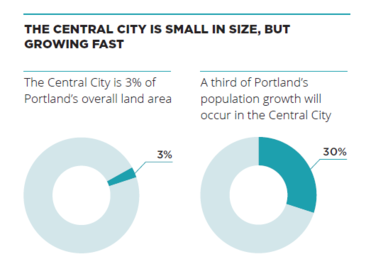 All this growth will happen in 5 square miles – only three percent of the land area in Portland. Central City in Motion recommends 18 key projects, building upon a robust trajectory of plans designed to create a better city: The Comprehensive Plan; Central City 2035 Plan; Transportation System Plan; NE, SW, and SE Quadrant Plans; and 2030 Bicycle Master Plan. 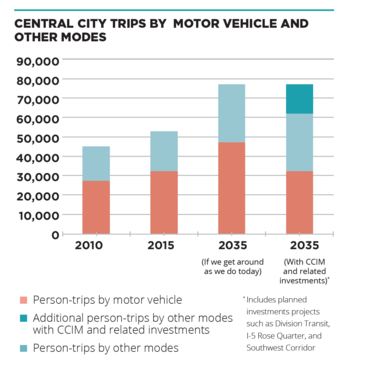 Central City in Motion prioritizes specific transportation projects to be built over the next five years, as well as providing guidance for the Portland Bureau of Transportation’s plans over the next 10 years, recommending a total of $72 million of investments. These projects will dedicate more than nine miles of right-of-way to transit investments, create nearly 100 safer crossings for people walking and rolling, and create or improve nearly 30 miles of low-stress bikeways. Taken together, these improvements will create a more reliable transportation system, both in the Central City and throughout the region. Since 2012, the Portland Bureau of Transportation has been grappling with how to accommodate all these new Portlanders. Portland’s iconic Central City has long been the center of innovation, from transforming a parking garage into Pioneer Courthouse Square, to the removal of SW Harbor Drive to make way for Governor Tom McCall Waterfront Park. The question now is, how do we support the continued growth of our vibrant city core? After over 50 meetings, workshops and outreach events with community stakeholders and three online open houses with over 9,000 participants, a plan has taken shape that we believe will help move Portlanders to their businesses and homes efficiently, while also helping us meet crucial carbon emission reduction goals as we continue to battle the global impact of climate change. We call the plan Central City in Motion. Planning transportation improvements in the Central City poses unique challenges and opportunities. Portland has a narrow street grid, especially in the Central City. And even with those narrow streets, public rights-of-way already account for 39 percent of the Central City’s land area, thanks to the city’s founders’ decision to lay out the downtown core in short, 200-foot-long blocks. Even though our population is growing and the economy is expanding, our roadway space is not. Since we can’t add new streets to the Central City as we grow, we will need to invest and upgrade the existing transportation system to make it more predictable, reliable and safe for residents and businesses to use other travel modes. If we don’t take action now, it will become more difficult to travel around the Central City – whether you’re on foot, a bike, riding a bus, or in a car or truck. 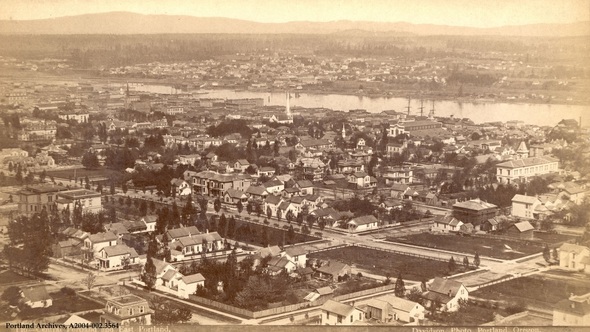 Portland isn’t the first city to face this challenge. We talked to business and transportation leaders in peer cities – Seattle, Vancouver and Calgary – all of whom have made significant investments in human powered transportation (biking, walking, rolling) and transit in their central cities in recent years because of substantial population growth in their communities. Those investments have paid off. Seattle added 60,000 jobs in its downtown core and yet 4,500 fewer people drove to work. Smart investments in their transportation network meant all the new commute trips were accommodated by transit, ridesharing, walking, and biking. Seattle’s transit ridership is now growing faster than any other city in the country. In Vancouver, the investment in protected bike lanes downtown on two of their main streets increased the percentage of trips made by women on bike by 11 percent and, between 2007 and 2012, the average daily distance driven per resident fell by 27 percent citywide. In Calgary, the percentage of bike trips made into and out of downtown increased by 40 percent in a single year following a protected bike lane pilot. Numerous survey respondents to PBOT’s Central City in Motion surveys provided similar feedback: Build protected bike lanes and I will bike downtown. Make transit faster and more reliable and I will take the bus. Every bike or bus trip is one less car on Portland’s streets. With that in mind, isn’t it everyone’s best interest that we encourage as many people as possible to choose alternate modes of transportation? Less cars equals less traffic, more parking and cleaner air. Despite the divided times we live in today, PBOT’s outreach suggests this is something all Portlanders can agree on. 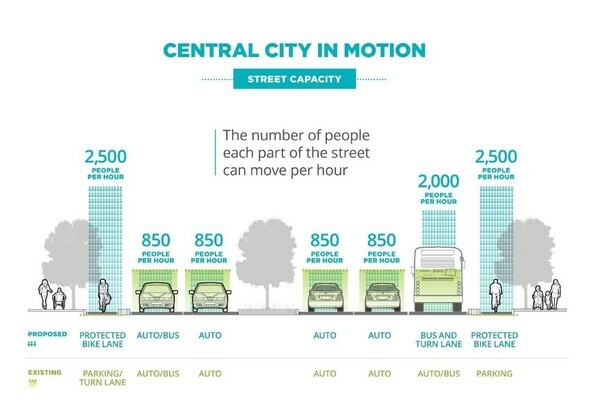 If we do nothing and all the new residents and commuters in our Central City traveled around as we do today, the result would be a 35 percent increase in the number of cars on Central City streets. Imagine thousands of additional cars attempting to jam into our already congested streets at the busiest times of day. The investments in the Central City in Motion plan are designed to avoid this future, holding traffic congestion steady for the next two decades, despite the thousands of new residents and jobs. The final Central City in Motion Implementation Plan includes an updated prioritized project list, reflecting recent input from project stakeholders. The following projects are now included in the 1-5 year implementation schedule:Another important part of Central City in Motion is maintaining freight access, particularly in the Central Eastside Industrial District, which is home to 1,100 businesses and 17,000 jobs. Ensuring that new residents and commuters have comfortable and convenient transportation options other than driving is critical to the sustainability of the Central Eastside. Shared bus and freight priority lanes have been identified, with wide turning radii maintained in areas where businesses depend upon large trucks and delivery vehicles. In some places, streets have been redesigned to ensure that freight access is maintained while improving safety for bicyclists and pedestrians. Bus priority lanes create a more efficient transit system, helping service workers and others who travel into the Central City to access jobs and other services. To ensure adequate time for public testimony, we have moved our presentation to City Council to Thursday, November 15. Join us on Thursday at 2:00 p.m. at City Hall as we present our plan to City Council to keep Portland’s Central City moving for all. Interested stakeholders can also sign up for project updates or contact the project manager via the project website: http://www.portlandoregon.gov/transportation/ccim. Supporting documents and designs related to Central City in Motion have also been posted there. Portlanders with questions or concerns about the projects are invited to contact the project manager directly – such input will be very helpful as we work to design Central City in Motion projects with the most benefits and fewest impacts. Questions about Central City in Motion? Contact Gabe Graff, Project Manager, at Gabriel.Graff@portlandoregon.gov or 503-823-5291.